When I was designing Kari Chapin's new book The Handmade Marketplace, an idea hatched in my head. 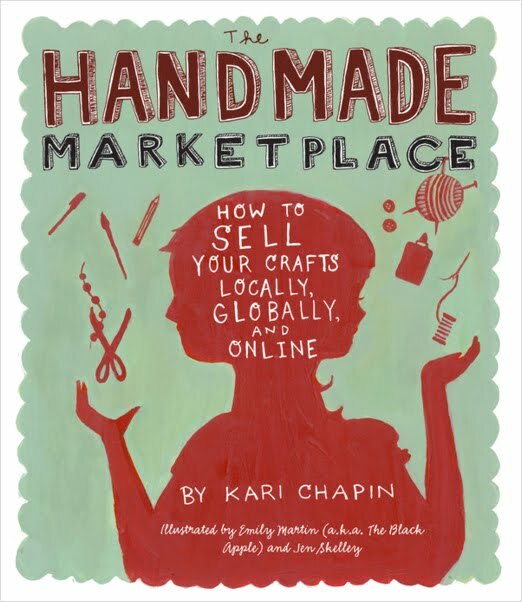 Though the core of her book is about how to sell your crafts, it also talks about the crafting community and the support and inspiration you can find there. The book itself is a model of that, as over two dozen luminaries of the craft world lend their wise and uplifting words to the pages. While I don't have an interest in crafting as a business, I'm definitely interested in sharing what I make and learning from others. My idea was to start a craft club and bring together some smart, creative people every month to make something together by hand, from sewing to printmaking to embroidery and more. With an eye to experimentation in crafting skills, the name Craft Lab was born. Over several months I talked the idea up and collected names of people who might be interested. Then we had a planning meeting to talk about logistics, as it's a lot more complicated than a book club or knitting club: where do you gather when a dozen people need a lot of space and might be messy; how do you get all the project materials, who pays for them, and when; how do you lead each lab so people come prepared and learn something interesting every time? . . .
Now I am on the cusp of announcing the very first Lab as soon as the host and I work out some final details! It's been a lot of legwork so far, but I'm excited and hope it's fun and successful. The only thing better than shutting myself up for a whole weekend on a crafting binge is madly crafting for a couple of hours with other creative people. On that note, I just sent off my registration form for the Squam Art Workshop in June. I've read so many wonderful testimonials on blogs about this art retreat, I'm excited to be able to participate myself. See you there? !